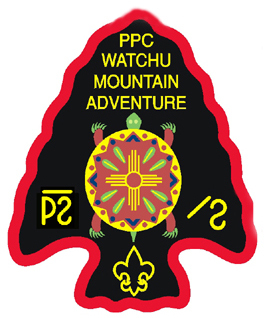 The Watchu Mountain Adventure arrowhead patch is awarded to those Scouts and advisors who complete the Watchu Mountain Adventure weekend in May as part of their Philmont training. The Watchu Mountain Adventure is held at Camp Wheeler in the Allamuchy Scout Reservation. The camp is located in the mountains of western New Jersey. This is the land of the Lenni Lenape Indians. The Lenni Lenape Indians of New Jersey were made up of three main tribes. The Munsee (People of the Stony Country) lived in the north; their totem was the wolf. The Unalachtigo (People Who Live near the Ocean) inhabited the southern part of the state in an area extending from just north of Camden across the state to the Barnegat Bay; their totem was the turkey. The Unami (People Down River) inhabited the central area of the state where Allamuchy Scout Reservation is today; their totem was the turtle. The turtle, totem of the Unami tribe, was chosen as the central symbol of the patch. It is also a reminder of Chief Watchu and the importance of his role in the training of youth. The turtle is surrounded by three symbols in yellow. Below is an outline of the fleur-de-lis, which represents the universal Scout symbol and reminds us that Philmont is a unique destination for scouts from all around the world. To either side are the cattle and horse brands of the Philmont Scout Ranch. They are reminders that Philmont is a working ranch to this day and of the colorful and varied history of the Scouts' destination. The back of the turtle includes the New Mexico Zia. The Zia sun symbol is from the Indians of the Zia Pueblo and helps to tie the eastern woodland Indians to those of the southwest. The Watchu Mountain Patch was designed by Tim Avis and Al Metauro. Al was responsible for the initial arrow head design along with fleur-de-lis and the Zia. Tim refined the arrowhead and designed a variation of the Unami turtle.